On April, 2nd, 2015, our 1t/h dry type fish feed pellet extruder was shipped to Plateau state, Nigeria. 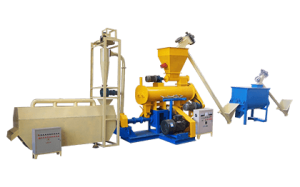 This floating fish feed pellet machine is designed to process kinds of raw materials into nutrition-balanced fish feed. It can be applied in floating fish feed, sinking fish feed, and shrimp feed pellets production line. Generally speaking, both dry type and wet type can produce pet feed, and floating & sinking extruded fish feed pellets. Those pellets can float on the water for at least 12 hours. 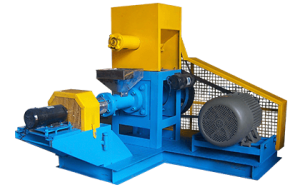 However, if customers choose wet type fish feed pellet extruder, steam-generating installation (boiler) should be equipped with it, dry type with no boiler. 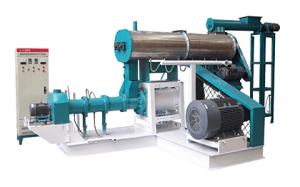 Under the same power conditions, wet type fish feed pellet extruder is with higher yield than dry type. Therefore, if you are running a small- or medium-scale fish farm, we will recommend you to choose dry type fish feed making machine. It is efficiency enough to satisfy your production demand with a lower price.